It appeared in the December 21, 2012 paper, and appeared three more times on successive Fridays. The ad provoked my curiosity, so I called Daryll to ask him about his solution. He is a very friendly, older gentleman who lives in upstate New York. He said he has no background in code breaking, apart from working codes as a hobby in the free time resulting from his retirement. He took out the ad in the San Francisco Chronicle because he had submitted his solution to the Vallejo police department and the American Cryptogram Association, and received no responses. His plan was to charge $5 for the solution, but when he realized he wasn’t going to make any money, he decided to mail out copies for free. The use of anagrams allows many possible solutions and interpretations. 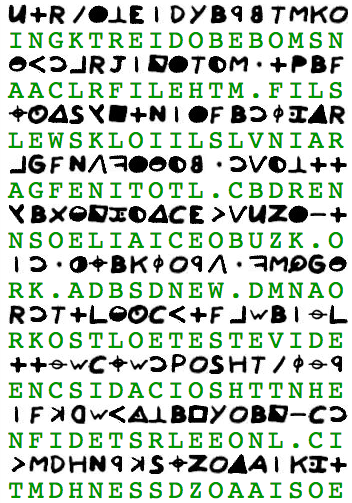 51 out of the 63 different symbols of the cipher text are allowed to have more than one plain text letter assignment. For example, Daryll allows the symbol to represent seven different letters: A, E, F, I, N, O and S.
With so much freedom, you can overcome the constraints of the cipher text and produce numerous coherent messages. CAN HE BE ONE REALLY NOBLE GHOST? NO. ONE NOTABLE CRONY: HE SHALL BE GONE. NONE HEALS. BOTH ENABLE NECROLOGY. With so many possibilities, we cannot be certain any of them is a better guess over any other. The text HERCEANBASHOLTGOONEEBNLOLNEY has 91,895,840,751,505,190,400,000 (91 thousand billion billion) possible rearrangements. Even if only one in a trillion of those rearrangements resemble real sentences, there would be almost 92 billion of them. Anagramming the plain text gives you a very large canvas of words to work with. In the text HERCEANBASHOLTGOONEEBNLOLNEY, you can find almost 3,000 words that are at least six letters long. The full list can be seen here. Which words can you build a sentence with? While these aren’t perfect fits, look at how coherent those excerpts are, derived solely from the 63 letters Daryll manipulated to form a Zodiac-related sentence. And since symbols are allowed to replace more than one letter, you can manipulate the leftover letters to form more interesting words. Daryll told me he does not have a computer, so I doubt that he has seen the other solution attempts online that use similar “constraint reducing” techniques, such as Hal Kravcik’s solution, John Cecil’s solution, and Oczan Turkmen’s solution. Graysmith’s solution, too, suffers from the same excessive liberties. 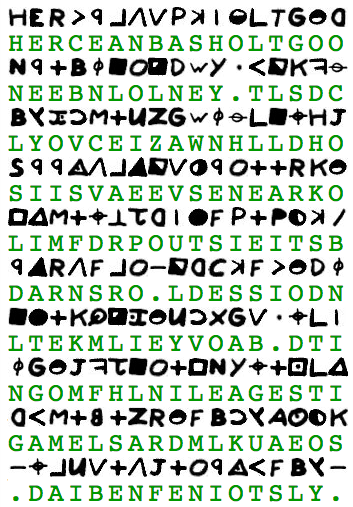 But what if the Zodiac really did author the cipher using anagrams, or some other constraint reducing technique? If he did, we would need some strong evidence to exclude all the other solutions that can be generated using the same methods. This is not to say that anagramming is not useful or valid for code breaking. Indeed, when solving transposition ciphers which rearrange plain text into chunks of gibberish, looking for anagrams of certain words can help unlock the transposition scheme. But in those cases, the rearrangements are subjected to an orderly scheme, rather than to the whims of the codebreaker. The same is true of polyalphabetic ciphers that assign more than one plaintext letter to a given cipher symbol. These, too, are subjected to orderly schemes. So, Daryll, I respect your effort, and hope that these explanations may help you refine your approach. I tried to break this code , the temptation to change one letter to another was too great. I know that you cannot do that and get the correct solution.I know that this sounds a bit crazy, but I am beginning to think that this code was done in a foreign language. 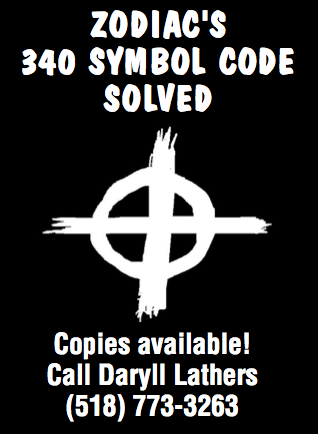 I found a clue once on Zodiackiller.com . that made me think the code was done in Portuguese. I spoke Portuguese before English and at one time could read it, but over the years of not speaking or reading it, I have forgotten how. Perhaps someone else can try it in Portuguese ? He’s either George Hodel or some sicko who has gone way to far up in rank. He’s a dog poisoner. the 340 Code. Way to go Lathers!!!!!!!!!!!!!!!!!!!!!!! I got “Most Evil” and recognized a lot of clues that came to me over the telephone years ago at Ft. Ord. Now I have heard something about a barn because i wrote down a barn with no animals. Interesting the dog poisoner was at our base and that has been mostly changed history. The Paine family are other sufferers. Hodel would have been untouchable and who else would have been untouchable. Go figure! God bless all of you for trying. God helped me out of that abyss with a purpose. I had a dent in my skull and floated my way out 4/30/88 so on the anniversary of my survival he tried to get rid of me and my children. We didn’t have a dog. ← Did Zodiac use Kahn’s “Codebreakers” book?